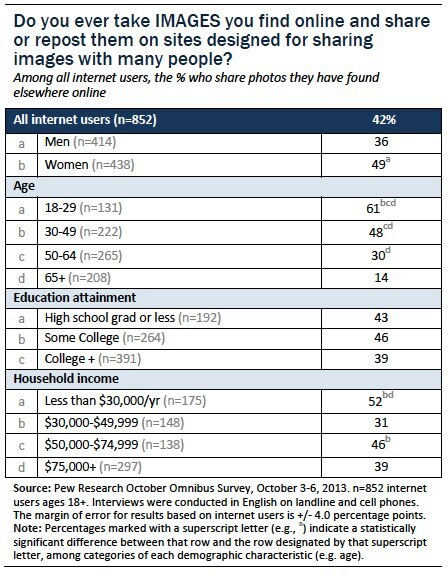 Among internet users, young adults ages 18-29 are particularly likely to post pictures they take online and women are more likely to do so than men. More than half of women do so, along with more than three-quarters of young adults. Some 26% of internet users post videos they take online, about half the proportion who post their own pictures. 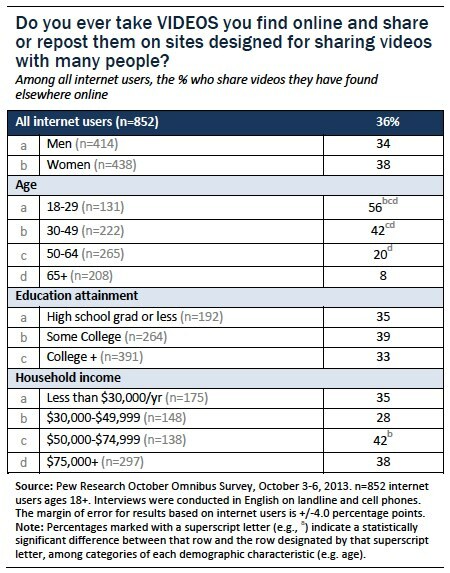 Again, young adults are particularly likely to post videos. Fully 54% of internet users post photos or videos online that they have taken themselves. Those under 30 are particularly likely to be creators and women are more likely to be creators than men. Sharing images and videos found elsewhere on the internet is also significantly more popular this year than last. 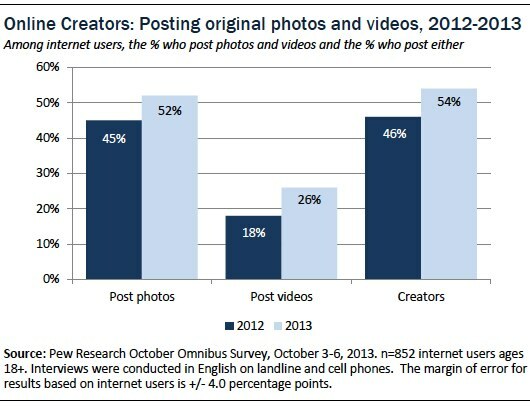 Some 42% of internet users repost images, while 36% share others’ videos. 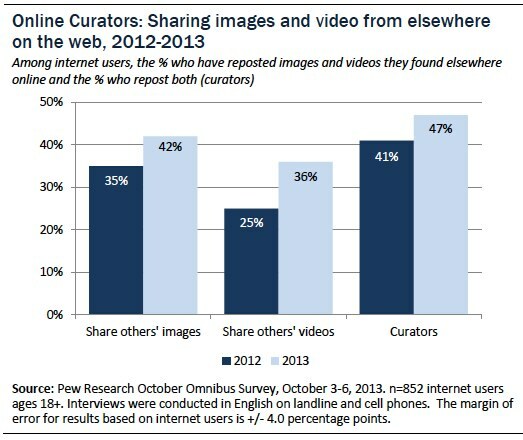 Fully 47% of internet users share images or videos they find elsewhere online. Reposting images is particularly popular among younger people and women are more likely to repost images than men. 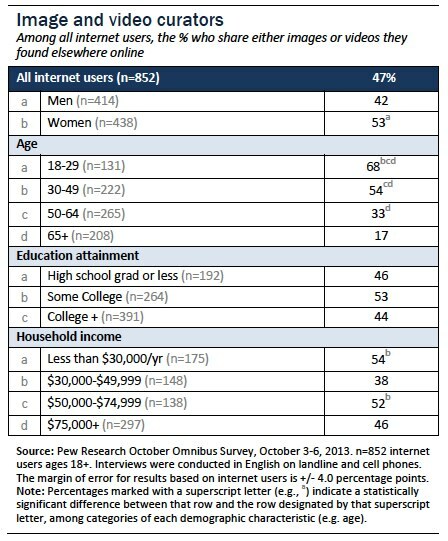 Half of female internet users do so, along with six-in-ten of those internet users ages 18-29. Reposting videos is most popular among internet users ages 18-29. More than half of these young adults repost videos. Young adults are particularly likely to be curators and women are more likely than men to curate photos and videos online. Among internet users, 53% of women and 68% of those 18-29 repost images and videos they find elsewhere on the web. Photo- and video-sharing is also shaped by the mobile landscape. 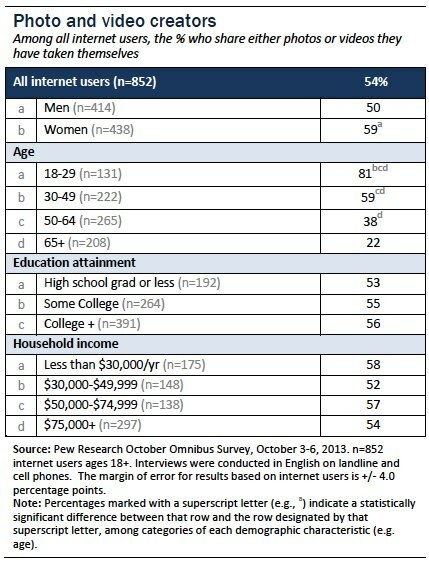 Fully 92% of adults own a cell phone, and 58% own a smartphone. The ease with which mobile phones allow users to take and upload pictures on-the-go has created easy paths for photo-sharing apps. In this survey, we examined two such apps – Snapchat and Instagram. Snapchat is a photo- and video-sharing app that automatically deletes messages soon after they are received. Senders determine an amount of time a recipient can view the image, and once it has been viewed the image is not longer available. This is the first time we have measured Snapchat use. 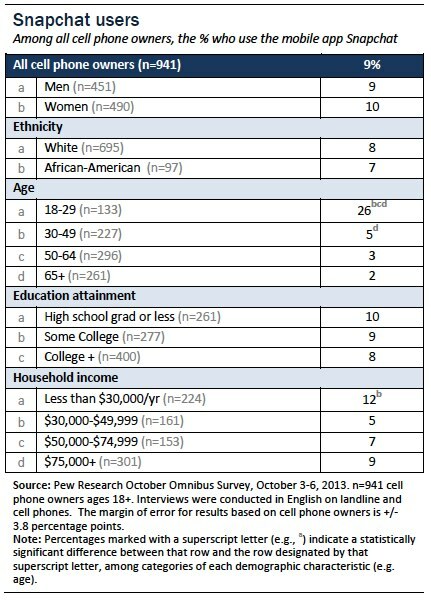 Some 9% of cell phone owners use the app. 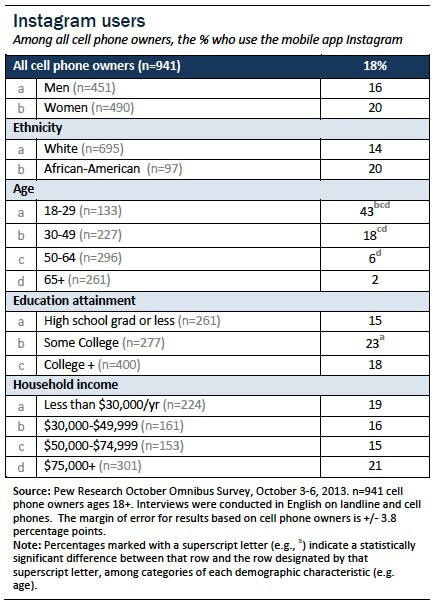 It is especially popular among cell owners ages 18-29, 26% of whom use the app. Among all smartphone owners, 12% use Snapchat. Instagram is a photo- and video-sharing app that allows users to apply different shaded filters to their images before posting on their profile. The app is structured like other social media models, where users can follow each others’ profiles, indicate their appreciation of different images, and comment. This is the first time we have asked about Instagram among cell phone owners (we have previously asked about Instagram among internet users). Some 18% of cell owners use Instagram on their phones. 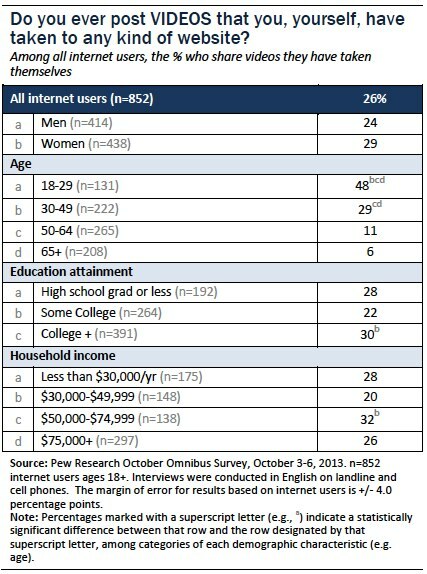 Those 18-29 are particularly likely to use the app, with 43% saying they do so. 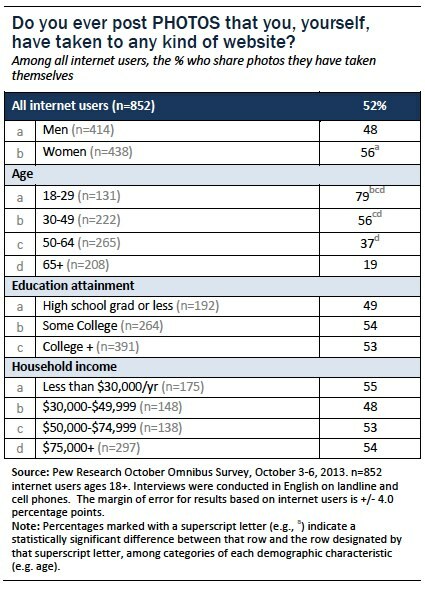 Among all smartphone owners, 28% use Instagram. Instagram also has a relatively active user base. 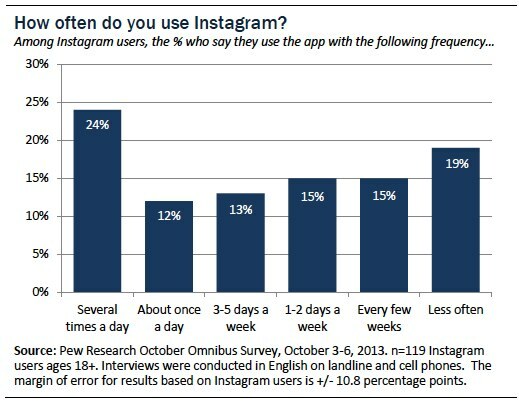 We measured frequency of use and found that more than a third of Instagram users say they use the app on a daily basis, and a quarter say they use it several times a day. Almost three-in-ten cell owners use Instagram on a weekly basis. But still, another third of users are only on the app every few weeks or less often.